The band members have also performed and recorded (both individually and as a band) with a wide range of other artists including Bob Dylan, The Rolling Stones, Meat Loaf, Neil Young, Lou Reed, Bonnie Tyler, Air Supply, Dire Straits, David Bowie, Peter Gabriel, Stevie Nicks, Tom Morello, Sting, Ian Hunter, Paul McCartney, Ringo Starr, Ray Davies, Ronnie Spector, Gary U.S. Bonds, Darlene Love, Southside Johnny, The Grateful Dead, Santana, Lucinda Williams, Steve Earle, Emmylou Harris, Tracy Chapman, Lady Gaga, Aretha Franklin, and Bob Seger. When not working with Springsteen, members of the band have recorded solo material and have pursued successful careers as session musicians, record producers, songwriters, actors and other roles in entertainment. The most highly visible in their separate careers are drummer Max Weinberg, who has led his own band, first on Late Night with Conan O'Brien and then on the Tonight Show with Conan O'Brien, from 1993 to 2010, and guitarist Steven Van Zandt, who starred as Silvio Dante in the HBO television series, The Sopranos, from 1999 to 2007, and as Frank "The Fixer" Tagliano in the 2012-2014 Netflix series, Lilyhammer. The E Street Band was founded in October 1972, but it was not formally named until September 1974. 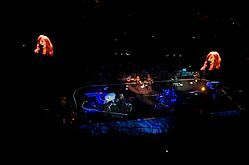 Springsteen has put together other backing bands during his career, but the E Street Band has been together more or less continuously since its inception. The original lineup included Garry Tallent (bass), Clarence Clemons (saxophone), Danny Federici (keyboards, accordion), Vini "Mad Dog" Lopez (drums) and David Sancious (keyboards). The band took its name from the street in Belmar, New Jersey, where Sancious' mother lived. She allowed the band to rehearse in her garage. Tourists to the area seeking sight of early Springsteen haunts often mistakenly believe the house was on the corner of E Street and 10th Avenue, perhaps due to the song "Tenth Avenue Freeze-Out" about the band's beginnings. The Sancious house was at 1107 E Street with the garage squeezed between the house and the southside fence. Springsteen's debut Greetings from Asbury Park, N.J. was released in January 1973, and the band's first national tour began in October 1972. Sancious, even though he played on the album, missed that first tour. It was not until June 1973 that he began appearing regularly on stage with the band. This lineup remained stable until the early 1980s when Van Zandt left to pursue his own career, a move that was announced in 1984. He would later rejoin the band in 1995. In June 1984, Nils Lofgren (guitar, vocals) was added to replace Van Zandt; Springsteen's future wife Patti Scialfa (vocals, later guitar) was also added to the lineup. By 2002, the band also included Soozie Tyrell (violin, vocals). Tyrell had earlier worked with Scialfa touring with Southside Johnny and the Asbury Jukes and sporadically with Springsteen dating back to the early 1990s. Whether Tyrell became as full-fledged a member as the others remains unclear. Some press releases refer to her as a "special guest", the cover notes of Live in Barcelona list her as a "with" member, the liner notes of We Shall Overcome: The Seeger Sessions refer to her as "violinist with the E Street Band", and some press releases don't mention her at all. When asked about the lack of mention in a press release prior to the Magic Tour, Springsteen just said in response, "Soozie will be with us." On November 21, 2007, it was announced that Danny Federici would take a leave of absence from Springsteen and the E Street Band's ongoing Magic Tour to pursue treatment for melanoma, and was temporarily replaced by veteran musician Charles Giordano. Springsteen stated at the time: "Danny is one of the pillars of our sound and has played beside me as a great friend for more than 40 years. We all eagerly await his healthy and speedy return." 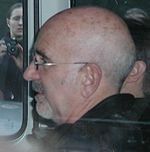 Federici made his only return to the stage on March 20, 2008, when he appeared for portions of a Springsteen and E Street Band performance at Conseco Fieldhouse in Indianapolis; he died on April 17 that year at the Memorial Sloan-Kettering Cancer Center in New York City, having suffered for three years with melanoma. Springsteen's album Working on a Dream is dedicated to him. Giordano has since become an unofficial member of the band. Clarence Clemons suffered a stroke on June 12, 2011. He underwent two surgeries, after which he was declared to be in a serious but stable condition. According to Rolling Stone magazine, he showed signs of recovery; however, he died from complications caused by the stroke on June 18, 2011. Clemons' nephew Jake has since filled his role on the saxophone as an unofficial member. Van Zandt also began to establish himself a reputation as a producer/songwriter. Apart from helping out with production on Springsteen albums, he worked with his "other band", Southside Johnny & the Asbury Jukes, as well as with Ronnie Spector and Gary U.S. Bonds, before he launched his own solo career as Little Steven. The E Street Band and Springsteen regularly helped out on all these projects. In 1977, they recorded a single with Ronnie Spector featuring a cover of the Billy Joel song, "Say Goodbye to Hollywood", and a Van Zandt original, "Baby Please Don't Go". This was the first time the band received a full credit. In 1978, Weinberg became an "honorary Juke" when he recorded Hearts of Stone with Southside Johnny. Finally, in early 2007, E Street Band members separately traveled to Atlanta to contribute to Springsteen's Magic. Concurrent with the album's release in October 2007, the Magic Tour began. However, after the conclusion of the tour's first leg on November 19, 2007, Danny Federici took a leave of absence from the tour to pursue treatment for melanoma; he was replaced by Sessions Band member Charles Giordano. Federici made his only return to the stage on March 20, 2008, when he appeared for portions of a Springsteen and E Street Band performance in Indianapolis. He died on April 17, 2008. Nineteen-year-old Jay Weinberg filled in at drums for his father, Max, during portions of shows, or for some full shows, during the 2009 Working on a Dream Tour. This was due to the elder Weinberg's obligations for the debuting The Tonight Show with Conan O'Brien. On December 17, 2013, the Rock and Roll Hall of Fame announced that the E Street Band would be inducted in 2014 under The Award for Musical Excellence induction category. The band was inducted by Springsteen on April 10, 2014. Bittan, Clemons, Federici, Lofgren, Lopez, Scialfa, Sancious, Tallent, Weinberg, and Van Zandt were all inducted and each given time to speak, with the family/widows of Federici and Clemons representing their husbands. 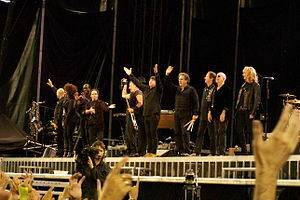 Following the induction, Springsteen and the E Street Band – with Lopez, Sancious and The E Street Horns – performed "The E Street Shuffle", "The River" and "Kitty's Back". "They should have figured it out before the band started passing away," grumbled Lofgren. "Clarence and especially Danny both took our exclusion hard, and neither is with us any more. So it was a bittersweet night." The High Hopes Tour kicked off in January 2014 and concluded in May 2014. The band was again joined by the horn section and by Tom Morello for the entire tour. Van Zandt missed most of the North American leg due to filming his television series, Lilyhammer. The tour supported Springsteen's 2014 album, High Hopes. Jake Clemons role in the band had been expanded and his interactions on stage with Springsteen were like those of his uncle. In 2015, Springsteen announced plans for The River Tour 2016. He had originally planned a solo tour, but felt that it would delay his next tour with the E Street Band for a few years. Envisaged as a short tour, it expanded to an eight-month outing from January 2016 to September 2016. The tour did not include Morello or the horn section, with the exception of Clemons. The band's second show in Philadelphia on September 9, 2016 was amongst the longest shows of Springsteen's career, clocking in at 4 hours and 4 minutes, two minutes shy of his longest show ever in 2012. An 11-date tour of Australia and New Zealand called Summer '17 took place in January and February 2017. ^ Fricke, David (January 21, 2009). "The Band on Bruce: Their Springsteen". Rolling Stone. Retrieved February 7, 2009. ^ "Bruce Springsteen Bands: from Rogues to E Street Band, passing from Castiles and Steel Mill". ^ "How The E Street Band Got It's [sic] Name". rockandrollgps.com. January 14, 2015. Retrieved February 8, 2017. ^ "Press Release". Shore Fire. January 30, 2003. Retrieved 2011-10-21. ^ "Press Release". Shore Fire. August 28, 2007. Retrieved 2011-10-21. ^ Phillips, Christopher (August 22, 2007). "Dates Are Set! Springsteen Revs Up E Street Machine For Fall". Backstreets.com. Retrieved 2009-03-07. ^ a b c "Statement" Archived July 16, 2011, at the Wayback Machine, Shore Fire Media, November 21, 2007. ^ Backstreets.com: Springsteen News accessed March 21, 2008. ^ AP (April 18, 2008). "Danny Federici of E Street Band dies at 58". 2009 The Associated Press. Retrieved 2009-07-24. ^ "Clarence Clemons Suffers From A Stroke « 104.3 K-Hits Chicago". Khitschicago.radio.com. Archived from the original on March 14, 2012. Retrieved December 19, 2015. ^ Andy Greene (June 13, 2011). "Clarence Clemons Reportedly Showing Signs of Recovery". Rolling Stone. Retrieved June 20, 2011. ^ Greene, Andy (June 18, 2011). "E Street Band's Clarence Clemons Dies at 69". Rolling Stone. Retrieved June 18, 2011. ^ "Clarence Clemons". Telegraph. Retrieved 2015-12-19. ^ Backstreets.com: Springsteen News. Retrieved March 21, 2008. ^ a b c Lapointe, Joe (January 29, 2009). "Springsteen Promises '12-Minute Party' at Halftime". The New York Times. Retrieved 2009-03-07. ^ Springsteen, Bruce (February 2009). "Super Bowl Journal". Brucespringsteen.com. Archived from the original on February 13, 2009. Retrieved February 11, 2009. ^ "Springsteen's "Secret Weapon": How Jay Weinberg Scored a Spot in the E Street Band". rollingstone.com. Retrieved February 8, 2017. ^ |newswell|text|FRONTPAGE|t Clemons' Nephew to Play Sax on Springsteen Tour. Associated Press. Retrieved February 11, 2012. ^ "Brucebase - 2014-04-10 - BARCLAYS CENTER, BROOKLYN, NY". ^ "Greasy Lake on Twitter". ^ "Sorry, Bruce Springsteen fans: The E Street Band won't tour in 2019". USA Today. USA Today. 4 December 2018. Retrieved 4 December 2018.